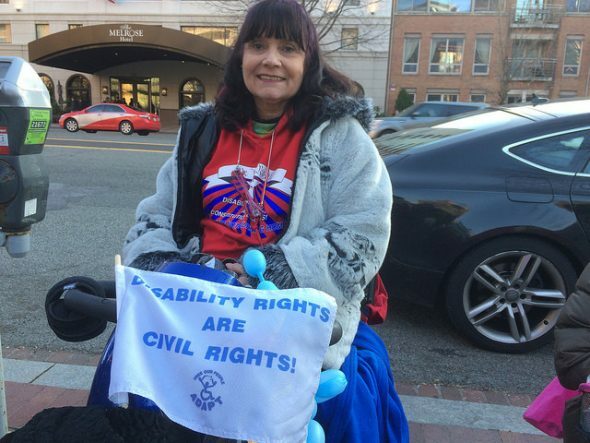 Washington, DC — A group of disability rights activists from around the country are urging the FDA to release new regulations that will permanently end Graduated Electronic Decelerator (GED) at the Judge Rotenberg Center (JRC) in Canton, Massachusetts, an education facility which specializes in habilitation of severely impaired persons. 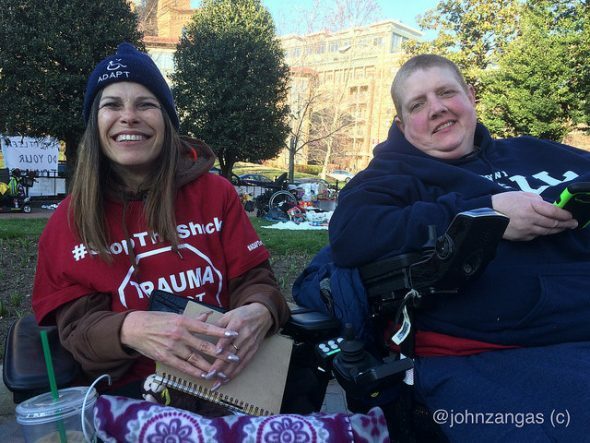 The activists have begun an indefinite occupation of a small park near FDA chairman Dr. Scott Gottlieb’s home, claiming he is delaying the release of regulations that would end the JRC practice of using GED shock therapy to discipline residents. 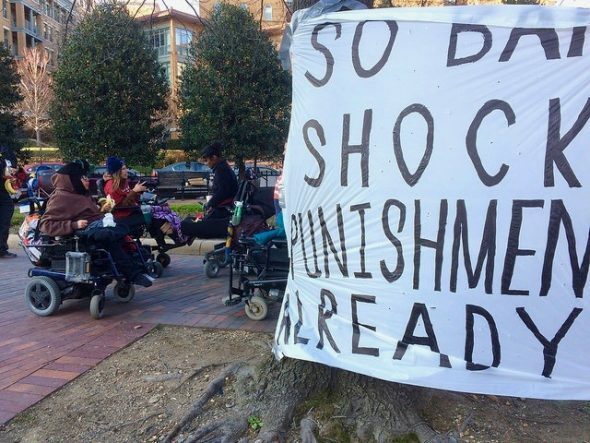 About fifty people from the disability rights group ADAPT started the park’s occupation, which is being live-streamed across the Internet to thousands. They say they will not end their protest until the regulations ending GED are signed and enacted by Dr. Gottlieb. The occupiers started their encampment Friday, March 9 on the sidewalk of 24th St. and Pennsylvania Ave. More are expected to join the protest in the coming week. DC police are parked nearby and keeping watch on the protest. At issue is the use of GED as an aversive shock therapy on the bodies of autistic and severely disabled persons to behaviorally modify the actions of resident students. GED electrodes embedded in straps are placed on the torso and arms of residents. Staff activate electrodes by a remote control device they carry on their waists. Activists say the device is being abused by staff and frequently used to deliver electrical shocks to those who do not comply with staff orders at the facility. They say the practice is harmful, an unproven method, and they liken it to torture. On Saturday afternoon, the activists took part in a theatrical demonstration entitled “Walk The Yellow Brick Road.” The demonstration mimicked the behavioral rewards mechanism in use by JRC staff to entice or force residents to follow behavioral guidelines through rewards of tokens or money which they can spend on privileges, or through aversive shock therapy, which is used as discipline. The “walk the yellow brick road” demonstration depicted the experience of being behaviorally modified through electroshock at JVC. 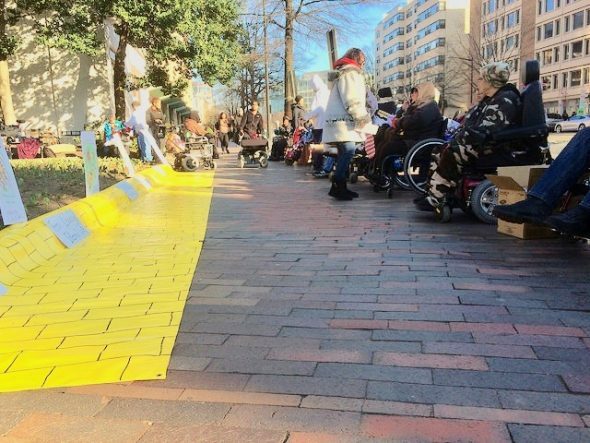 Jordan Sibayan, an organizer from Atlantis ADAPT in Denver, narrated to the audience while riding on the walk the yellow brick road replica tarp set out on the sidewalk. It was a mock-up of such a system of rewards and punishments in place at JRC to “coerce” residents to behave. As he took his audience through the experience of residents at JRC, he paused at an artist’s paintings displayed along points on the yellow brick road, depicting scenes of the abuse at JRC. By guiding the audience through in-depth descriptions of the physical side effects and emotional trauma shock therapy had on residents, some in the audience reacted to his poignant narrative with anger and emotion. “This device is used as a punishment tool on the autistic and the disabled,” said Priya Penner, another organizer with ADAPT. Penner reported that the staff was not limited to the purposes for which they could activate the shock device. “These punishments are for minor infractions, and this is considered torture by the UN,” she said. Pilgrim Tierney, who identifies as transgender and autistic, said that regulations which end the use of aversive shock therapy were written during the Obama administration and approved by the FDA in 2016. “In 2016, the FDA ruled that shock caused substantial harm, emotional harm, and trauma,” they said. Tierney also said that only one thing was required to put the regulations into practice, and that was the final signature of Dr. Gottlieb. Tierney also described the extensive grassroots actions already undertaken by ADAPT to finalize the regulations with Dr. Gottlieb’s signature. “We’ve gone to his office. We’ve gone to HHS. We’ve had over 100 arrested at both locations,” they said. Tierney also said that they just wanted to ask Dr. Gottlieb to watch a video of a youth at JRC being shocked 31 times in the span of 4 hours for not taking off his jacket. “Once he sees that video, there will be nothing else to say,” they said. JRC is the only known student residence facility in the U.S. to use aversive shock treatment on the autistic and severely physically disabled.